Although we perform many routine surgical procedures on a daily basis, a lot of our patients require surgery of a high degree of complexity. At Nantwich Veterinary Hospital we are able to deal with all sorts of surgical procedures from spinal surgery or cataract surgery to hip replacement surgery or bowel surgery to heart or lung surgery. Each surgical case has its own special requirements, and all the surgeons at the hospital have many years experience dealing with the variety of conditions we see from day to day. Nantwich Veterinary Hospital is equipped with state of the art surgical facilities to ensure that patients requiring surgery get the very best treatment. 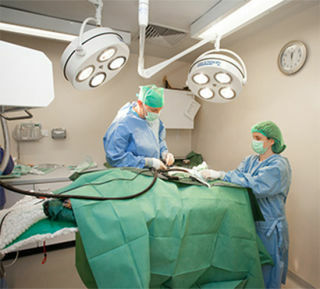 We have dedicated canine and feline surgical suites with the highest standards of surgical cleanliness and a wide range of surgical instruments to treat all manner of surgical conditions.